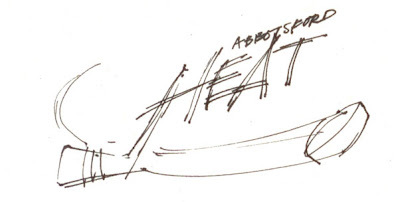 Ronn's Minor League Hockey Mania: Abbotsford Heat Logo Not Even Lukewarm! Abbotsford Heat Logo Not Even Lukewarm! The Abbotsford Heat (joining the AHL for the 2009/10 season), unveiled its new logo today... and what a disappointment it is! I was already underwhelmed by the name, the Heat, but the logo is just about as lame as you can get. The logo in no way looks like a hockey team logo, there is no appearance of flames or heat, the colours are extremely dull and the font they created for the logo looks like something you would find on one of those lame free font web sites. This is not good enough for a high school team, let alone a professional hockey team. I can guarantee you that I won't be wasting my cash to purchase anything with this logo on it!